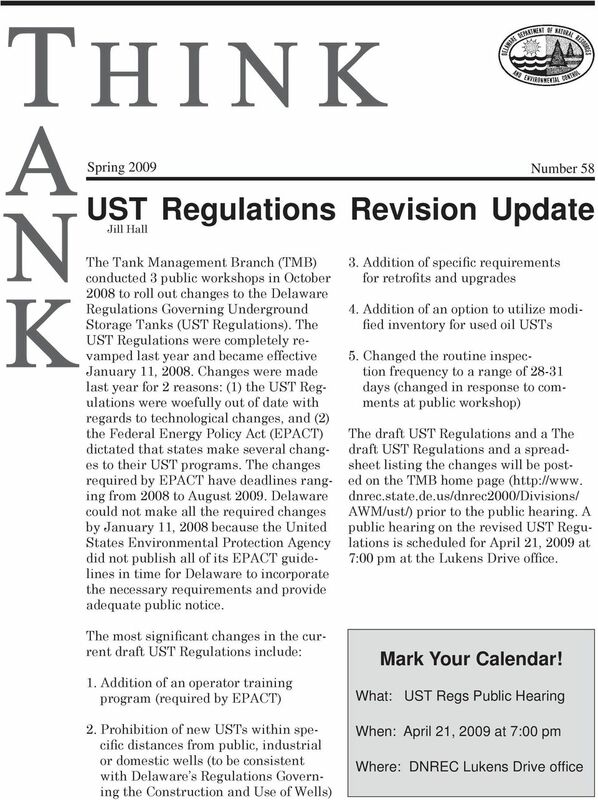 Download "UST Regulations Revision Update"
3 tems are only applicable to underground tanks. E85 vapor recovery systems cannot be co-mingled with existing vapor recovery systems. They will require their own system separate from the existing system. Facilities with E85 will, therefore, have two sets of vapor recovery permits and associated fees. Leak Detection Equipment Spill containment and overfill devices for use with ethanol must be made of stainless steel or appropriately coated. Standard leak detection devices, such as sump and interstitial sensors, are made of various metals, polymers and elastomers that may not be compatible with ethanol and could therefore malfunction, allowing leaks to go undetected. Standard Automatic Tank Gauges (ATGs) that use capacitance probes to make measurements and perform release detection will not work with ethanol. Ethanol has a high conductivity and capacitance probes must be used in a nonconductive product. At present, there are no probe floats that can accurately detect water before phase separation occurs. As little as 50 gallons of water in a 10,000-gallon tank can cause phase separation to occur, rendering the fuel unusable. Standard gasoline dispensing facilities were never designed to be water-tight. Installation Requirements All E85 dispensing systems must be certified com- patible with ethanol to prevent releases due to incompatibility. This cannot be accomplished with existing systems. In order to certify that dispensing facilities are E85-compatible, only new systems can be installed. New E85 dispensing systems should be continuously monitored so as to increase the likelihood that should a malfunction or component failure occur, the resulting release will be contained. Most newly manufactured vehicles are only E10- compatible. They are not E85-compatible. Use of E85 in ill-equipped vehicles will eventually cause engine damage. E85 vehicles require engines specifically designed for that fuel, i.e. Flex-Fuel vehicles. To minimize the possibility of mis-fueling vehicles by uninformed consumers, E85 fueling facilities should be handled like kerosene and located away from gasoline dispensers to minimize accidental fueling. Anticipate longer lead times associated with installing an E85 fueling system. 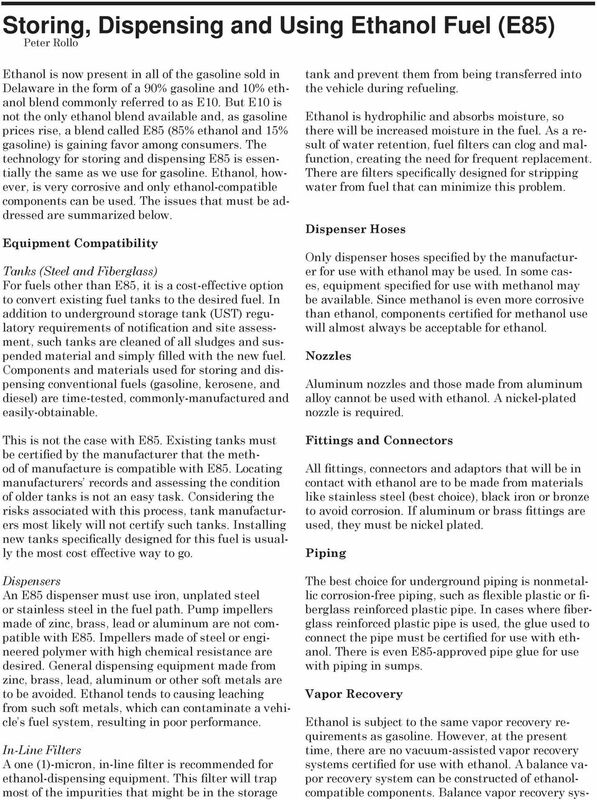 Equipment manufacturers may not stock some E85-compatible components, requiring them to be specially manufactured. The Fire Marshall has determined that E85 is to be treated like gasoline so they have no special requirements. However, the Office of the State Fire Marshall must still review your installation plan. To ensure that the E85 review and installation process goes smoothly, contact the TMB Engineer to discuss your installation. 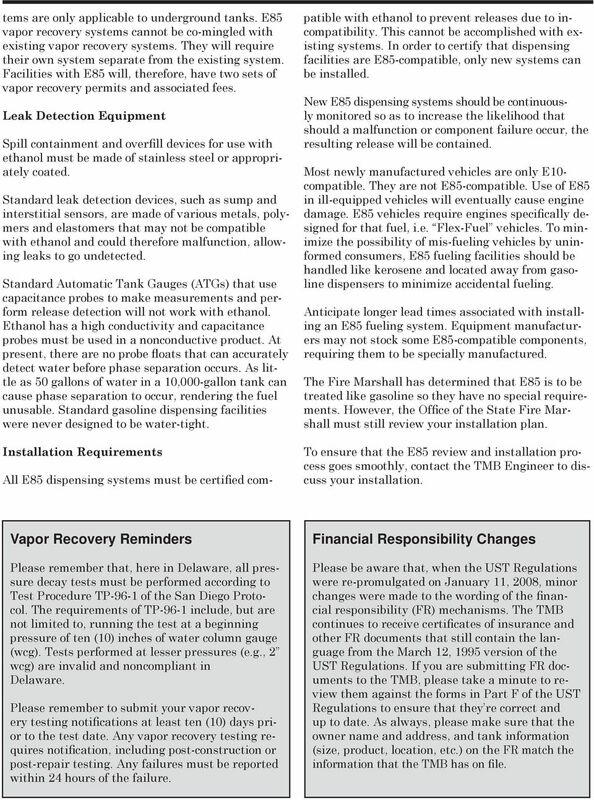 Vapor Recovery Reminders Please remember that, here in Delaware, all pressure decay tests must be performed according to Test Procedure TP-96-1 of the San Diego Protocol. The requirements of TP-96-1 include, but are not limited to, running the test at a beginning pressure of ten (10) inches of water column gauge (wcg). Tests performed at lesser pressures (e.g., 2 wcg) are invalid and noncompliant in Delaware. Please remember to submit your vapor recovery testing notifications at least ten (10) days prior to the test date. 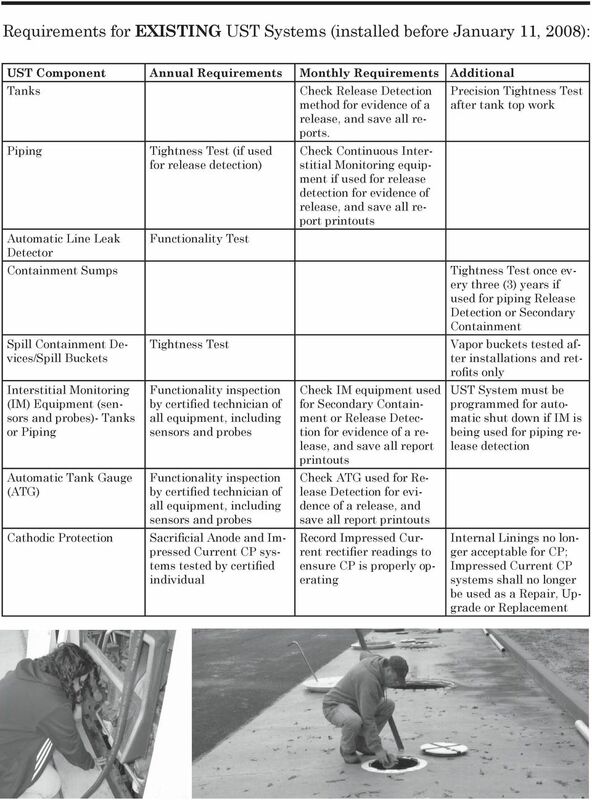 Any vapor recovery testing requires notification, including post-construction or post-repair testing. Any failures must be reported within 24 hours of the failure. Financial Responsibility Changes Please be aware that, when the UST Regulations were re-promulgated on January 11, 2008, minor changes were made to the wording of the financial responsibility (FR) mechanisms. The TMB continues to receive certificates of insurance and other FR documents that still contain the language from the March 12, 1995 version of the UST Regulations. If you are submitting FR documents to the TMB, please take a minute to review them against the forms in Part F of the UST Regulations to ensure that they re correct and up to date. As always, please make sure that the owner name and address, and tank information (size, product, location, etc.) 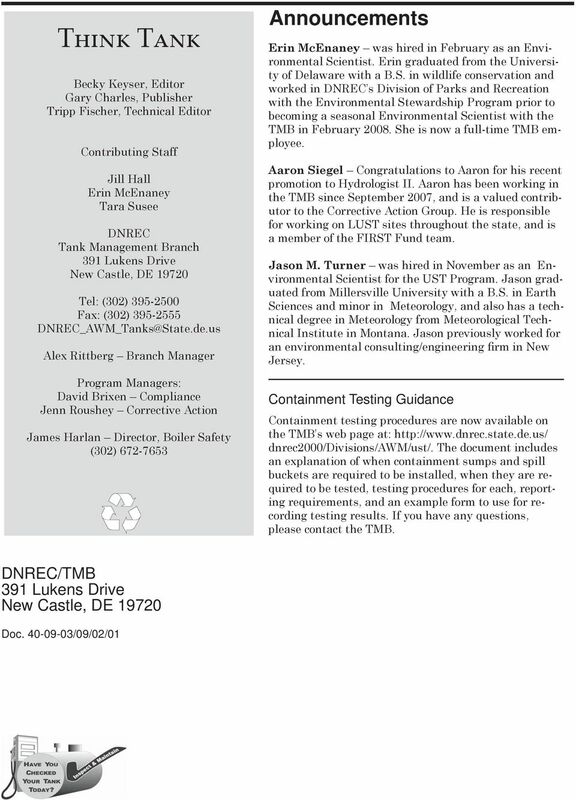 on the FR match the information that the TMB has on file. 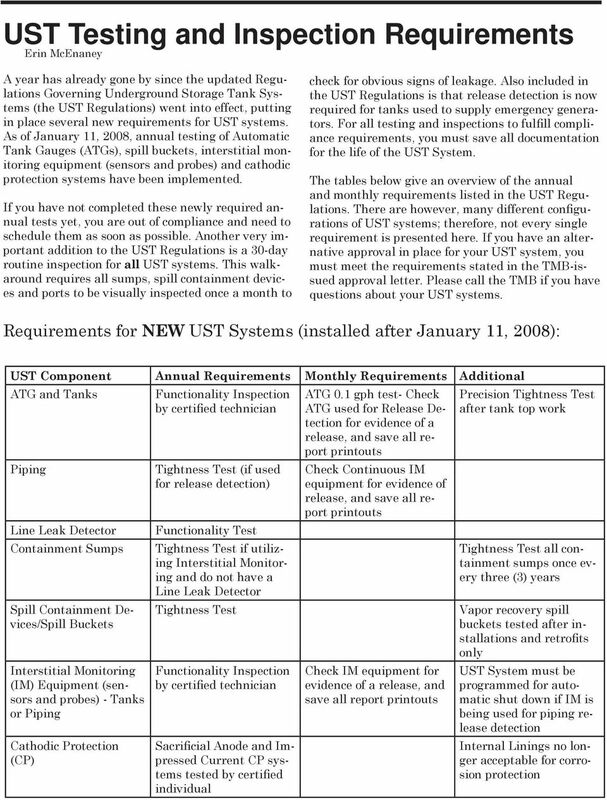 CHECKLIST FOR INSTALLING OR CONVERTING EQUIPMENT TO DISPENSE E15, E30 E85 AND OTHER BLENDS OF ETHANOL General Information: Is your project an equipment conversion, station remodel or new construction? Named Insured: Business Name (include dba if applicable): Mailing Address: Phone Number: County: In Case of Claim: Contact Name: Phone Number: Type of Business: Corporation Individual Partnership L.L.C. Welcome UST Owners & Operators!! Presenter: Greg Young Vaporless Manufacturing, Inc.
Elutron Fuel Storage Tanks Double-wall underground fuel storage tanks. Fuel storage tank: The Elutron tanks furnished for this project were built to store fuel oil to power a standby generator system. UNDERGROUND STORAGE TANK MONITORING PLAN ALAMEDA COUNTY DEPARTMENT OF ENVIRONMENTAL HEALTH CUPA Authority Cited: Title 23 CCR, Sections 2632(d)(1), 2634(d)(2), and 2641(h) TYPE OF ACTION 1. NEW PLAN 2. The On-Board Refueling Vapor Recovery (ORVR) Evaporative Emission (EVAP) system. www.opwglobal.com OPW EDGE Double-Wall Spill Containers Designed in collaboration with contractors and end-users, the OPW EDGE Double- Wall Spill Container installs in the same space as single-wall buckets.